The multi island state Saint Vincent and the Grenadines is located between Grenada in the south and Saint Lucia in the north. The main island St. Vincent is mountainous, has some rivers and waterfalls and a lush green vegetation. 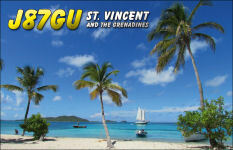 In contrary to the both neighbour islands St. Vincent is more or less untouched from mass tourism. But there are accommodations for every purse. The about 30 Grenadines islands are an outstanding sailing area. They lie like pearls in the tourquoise blue sea. You should not miss to visit the most beautiful of them, the Tobago Cays. You should take a plane from the neighbour islands Barbados, St. Lucia, Grenada or of course from St. Vincent to Union Island and the Catamaran to the Cays. You will find a breathtaking beautiful dive site in the shallow water - good for snorkelling too. Send your application well in advance; 8 weeks before you enter St. Vincent should be enough (better more). Licence fee is 40 US $ for one year, starting with the date of its issue.